Successful executives don’t invest in executive coaching. They invest in results. 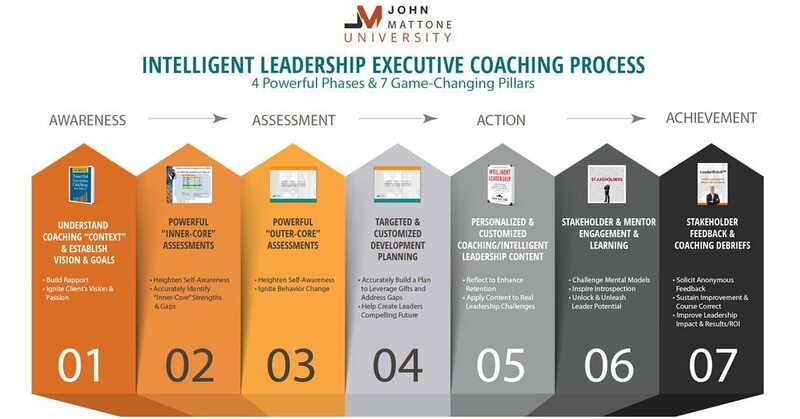 Discover and experience the unique and powerful components of the Intelligent Leadership (IL) Executive Coaching Blueprint created and mastered by John Mattone, the world’s #1 authority on corporate culture and leadership and the former coach to Steve Jobs, Roger Enrico, the former Chairman & CEO of PepsiCo., and hundreds of other highly successful global CEO’s and leaders. 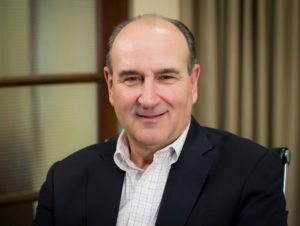 John Mattone’s Intelligent Leadership (IL) Executive Coaching Process is a 6 to 12 month “immersive” leadership and personal growth journey that unlocks and unleashes a leaders full potential so they truly become the best leaders and people they can be. John Mattone and his unique coaching process and mastered blueprint (which he certifies other global executive coaches in), achieves this by igniting and strengthening a leaders inner-core and outer-core, which enables them to realize 4 “game-changing” outcomes that they can leverage as leaders in their business and life: altruism, affiliation, achievement, and abundance (The 4 A’s). The 4 A’s are the seeds to achieving sustained greatness and creating a lasting legacy. The IL Executive Coaching journey begins with a short meeting involving the executive (high-potential, manager, director, vice president, senior executive, and C-level) and “sponsoring” executive/team if necessary to discuss the goals of the coaching experience, provide context and background, and discuss the proposed “roadmap” and coaching schedule. The balance of the day then shifts to the executive and I getting to know each other both “in the office” and “out” over lunch and/or dinner. My objective over the course of the day and following day, if necessary, is for us to build a foundation and bond of trust and rapport. Ultimately, I will assess the strength and vibrancy of both their “inner-core” and “outer-core” capabilities utilizing my general observations as well as a combination of a structured “in-depth interview” and objective assessments, including my own executive maturity assessment. I almost always build-in one day of shadowing, in which I observe the executive in action—on calls, in meetings, etc. I supplement these assessments with 360-degree interviews involving key stakeholders and constituents (board members, other C-Level executives, direct reports) as well as survey a larger population of employees using my Strategic-Tactical Leadership Index 360-Survey or the organization’s sponsored 360-Survey. I will then identify from my general observations, assessments, interviews, and shadow days, the executive’s leadership strengths and development needs. Typically, we schedule a full-day to debrief and discuss the themes and results of the assessments. I then transition to introducing the executive to their Core Purpose and creating their Core Purpose Statement (CPS). One of the most powerful methods for cultivating a leaders passion for the vision “of the essence” of the person they must become (even “bigger” than what they want to become), is having them create and live by a core purpose statement, philosophy, or creed. Such statements capture the essence of the person and leader they want to become (and must become), what qualities they want to develop (and must develop), what they want to accomplish (and must accomplish), and what contributions they want to make (and must make). Clarity on these issues is critical because it affects everything else—the goals they set, the decisions they make, the paradigms they hold, and the ways they spend their time. With my guidance and the use of my proprietary tools, the executive then prepares their initial leadership professional development plan (based on the diagnostic phase and their CPS) that focuses on strengthening their: (1) indisputable strengths; (2) surprise strengths; (3) indisputable development needs; and (4) surprise development needs. While this sounds like a lot, it is important to limit the executive to focusing on only one element per area. With my support, guidance and performance coaching, they then meet with their stakeholders and constituent groups individually and collectively to share any number of things, including: their drive and passion to become the best leader they can be and that they cannot achieve this goal without the input, support and guidance from them (this step can often be the most challenging for most executives). I coach (and provide the tools, professional development, guidance and preparation) the executive to invite and incorporate positive developmental suggestions from their key stakeholders and constituent groups so they can finalize their leadership development plan. With my on-going performance coaching, support and guidance, the executive then starts executing this plan while ensuring that key stakeholders and constituents provide quarterly feedback to the executive on the progress they are making on their leadership professional development plan. In general, throughout this process which can be 3 to 12 months, I work confidentially with the executive on implementing powerful change strategies that leverage their considerable leadership capabilities while also strengthening their professional development opportunities—coaching them on first strengthening their “inner-core” as a foundation to strengthening their “outer-core” leadership skills.